Are you looking for a midsize sedan? Our team at West Herr Ford Lincoln of Amherst recommends the Ford Fusion. The Fusion comes with a number of technology features that provide you with many benefits. Let's check out what technology features the Fusion has to offer. 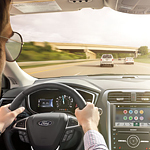 With the Fusion, you can choose the available SYNC 3 infotainment system. This system comes with Apple CarPlay and Android Auto. With Apple CarPlay, you can access Siri, Apple Music, Apple Maps, and make hands-free calls. Android Auto allows you to access Google Maps, Google Now, and Google Music. This infotainment system comes with a 3D GPS navigation system that provides you with voice-guided, turn-by-turn directions. The infotainment system also offers a trial subscription to SiriusXM Satellite Radio, SiriusXM Traffic, and Travel Link. The Fusion comes with FordPass Connect. This features an in-vehicle Wi-Fi hotspot that can power up to 10 devices. The hotspot can be accessed from up to 50 feet outside of the Fusion.